Col. Bernard Gruber, currently the commander of the 45th Space Wing Operations Group at Patrick Air Force Base, Florida, will take over command of the GPS Wing later this year. Gruber served at the wing’s predecessor organization, the NAVSTAR GPS Joint Program Office (GPS JPO) in the early 1990s, where he was involved with user equipment acquisition including the Selective Availability Anti-Spoofing Module (SAASM) procurement. He will replace Col. David Madden, perhaps as soon as May. 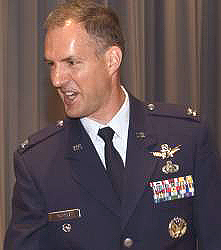 Gruber received his appointment as colonel in January 2006. The 45th Space Wing processes satellites, including GPS spacecraft, for launch at Cape Canaveral. The operations group, which Gruber has commanded since July 2007, maintains the Eastern Range assets and is responsible for airfield operations, weather, and communication support. Gruber was a military fellow at the Center for Strategic and International Studies in 2006–7. For an updated and lengthier analysis of Gruber’s background, click here.